I’ve only briefly flirted with hair oils in the past. I really like the idea of them and their claims of transforming my hair into silky smooth locks. I picked up the TRESemme Liquid Gold when I was in a rush, but desperate for something to tame my frizzy and unruly ends. In the past, I’ve never got on with TRESemme products. Their shampoos and conditioners tend to strip my hair and make it dry and unmanageable. The only product that has worked is their heat defence spray. I chose the Liquid Gold as I’d heard it could be a budget dupe for Moroccan Oil; the wonder product that seems to be on every hair and beauty enthusiasts lips. I must admit I was also drawn in by the packaging, whose gold detailing creates an air of luxury. Liquid Gold is rather runny and comes with a handy pump. The packaging suggests that you start with one pump, however, I have rather a lot of hair and it’s quite long so I found that two or three pumps were needed instead. I applied the product before blow drying, onto towel dried hair and found that it took a little longer for my hair to be fully dry. However, my split and dry ends did look considerably smoother and shinier. I feel that Liquid Gold has made my hair appear to be in better condition, but it doesn't feel as good as it looks. I had expected the product to improve the quality of my hair as well as its appearance (although I'm aware that no product can mend a split end). Instead my hair feels as if it's been coated with a film of product. This is exactly what silicone based products will do to your hair. I really wish I'd read the ingredients and done more research before purchasing this. Although it does contain both Argan and corn oil, the predominant ingredients are silicones. I will be finishing up this bottle, but certainly won't be repurchasing. I'd rather find a hair product with a higher proportion of natural ingredients next time. If you have any recommendations, I'd love to hear them! 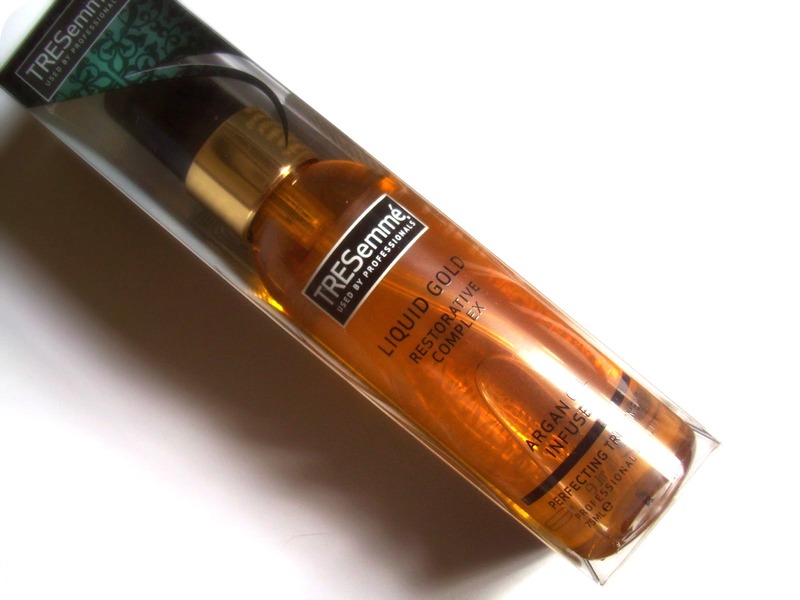 Have you tried TRESemme Liquid Gold? What hair oil would you recommend? I need to sort out my ends too (probs need to cut them really)! Glad I've seen your review though as I almost brought this today and was going to go back and get it, so don't think I will now. It's so disappointing! TRESemme never works for me! I've always wanted to try tresemme products but I've never noticed a differece when I've tried hair conditioning products so never got round to. I find that Tresemme products make my hair heavier and a lot harder to manage. I'm on the hunt for the right hair oil too. I want to try more of their products!